This bag is described as being made from 51% recycled material. I’m all for recycled material. This bag might work for a fast 15-items or less trip to the grocery store, but it fails to meet the needs of a hard-driving conference attendee. No zippers. No internal pockets. No key holder. No back pocket for papers and maps. No cool internal hidden pocket where you’ll leave something and forget it until the next conference (Oh wow – so that’s where I put that). No water bottle holder (plastic BPA free re-usable bottle of course). In all, it just doesn’t cut it as a conference bag. Lest I sound ungrateful or anti-green movement please know that I’m an outstanding recycler of past conference bags. In fact, I only need one good one and I’ll just keep using it over and over again. In fact I went to Seattle with my ACRL 10th National Conference bag which I think is the all-time hands-down champion of ACRL conference bags (see the photo in the post). Here’s my suggestion for how we can really save money and resources at the 15th National Conference. Provide an option on the registration form where attendees can indicate if they want a bag or not (e.g., Option 1 – I must have an environmentally-friendly bag; Option 2 – Never mind – I’ll bring my own). That way ACRL knows exactly how many bags to produce and bring and only those who want it get one (easily noted on their badge). End result – no wasted bags that end up in the trash. ACRL provided two other environmentally-friendly supplies for conference goers. One was a mug made of corn plastic. I guess that will eventually find its way into the jungle of unused mugs in one of my kitchen cabinets. The other one is already a permanent fixture in my shower. 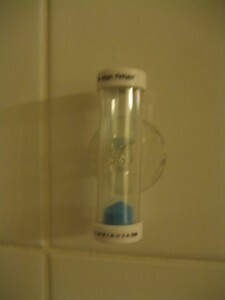 ACRL provided a nifty little shower timer that lets you know when four minutes have expired. According to Mary Ellen Davis, ACRL Executive Director, the average American takes an eight-minute shower. So we were given a tool to help save Seattle a whole lot of water during the conference. I used it everyday and never spent more than 3 minutes showering. I thought the thing wasn’t working right so I timed it with a stopwatch when I got home. It’s exactly 4 minutes. The real test will be when the kids come home for visits. If I can get them to take 4-minute showers I will be forever in debt to ACRL. But Steven, what do you do with all those frickin’ bags? I’d rather they didn’t give them out at all, myself. There’s too much useless junk in the world. Nor any other tchotskes. Except cookies or chocolate, perhaps. I did find one freebie useful once – a small packet of book darts. I’m actually using those. But to be honest, I’d rather have paid less for the registration and bought my own book darts. Okay, I’m off to bed. I’m obviously getting carried away. That’s what I’m saying Barbara – let’s stop giving out bags to everyone and just give them to the attendees who want it and will get it with the intent of using it again and again. I rarely even take the bag. But the big orange ones they have provided at the last two ALAs are in use in my household. They are great usable bags for grocery shopping. I’ve got a few others laying around my office. But I’ve definitely been “over-bagged” by conferences the last few years. As I said, I’d rather just bring my own favorite and use it again. 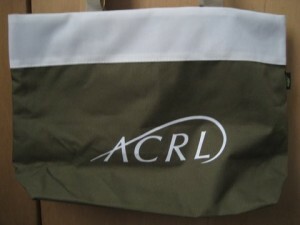 This newest ACRL bag will probably end up in my mulch pile since it is “recycled material”. I would certainly appreciate the option to decline a conference bag. In my opinion, the majority of them aren’t durable and are pretty dang ugly. And if people are traveling to the conference, they usually have their own, preferred bag. I would rather my membership fees went elsewhere, to something more productive and valuable… open access C&RL maybe? 🙂 Thanks for the post, and hopefully the ACRL2011 planning committee will take this idea into consideration. Steven, I have to differ in your opinion. The ACRL Baltimore bag cannot even come close to the bag that Atlas Systems gave out at their 10th International ILLiad Conference. I’m still trying to figure out how to get rid of the Baltimore one. This year’s ACRL bag is fine. As for pockets, it’s only a couple of days, it isn’t like you are using it all the time. As for the freebies inside. They should have saved money and resouces by not including them at all, I never used either and left both the mug and timer in the hotel room. I didn’t want to add any weight to my suitcase, as I was travelling for 11 days. And can I just add, those horrible orange bags from ALA . . . I threw mine out ASAP, no thank you to such a large ugly thing. This year’s ACRL bag will definitely will be a grocery bag. When I was checking out of my hotel in Seattle I saw an ACRL conference bag on top of the cleaning supply cart outside my room. I guess the folks in housekeeping wanted the bag because it was not in the trash, but the conference attendee obviously did not want it. I ended up giving mine away to a friend and she liked a lot. At least these two will not be in landfills. The no-bag option would be nice for those who do not want a bag. glad I wan’t the only one suffering from bag letdown. ACRL Baltimore was my first so I suppose I was spoiled with such a wonderful bag my first time out. I’ll agree with Steven on the best use for the Seattle bag, which made its first trip of many to the co-op today. Bag opt-out sounds like a great idea as well, but Erin’s durability issue brings up a good point – how long should I expect my beloved Baltimore bag to last? I would opt-out next time if that’s a possibility … but what if I miss out on a really great bag? Could one opt back in if there were surplus bags on Sunday? Couldn’t they just provide a detailed description of the bag with the registration materials? So you knew? I’m not really this shallow, I swear. I think all the things you missed in this bag are an even better an indication of how focused everyone is on *stuff*. There weren’t enough pockets for all your *stuff*. Solution – carry less stuff. The bag was perfect for my needs at the conference, which constituted carrying a notebook, pen, badgeholder when I wasn’t wearing it, empty coffeemug before I filled it, re-usable water bottle, and wristlet with cell/phone. There was room to spare. This spring NJLA will be having a conference tote bag recycling where attendees can bring their countless totes that are going unused and they will be re-purposed in some way. I like your suggestion about giving attendees the option to receive a tote, but I think you’re being a bit ridiculous in your criticism of a specific BAG. I gave the Baltimore bag to my husband and I use the Seattle bag for hauling lunch and reading material back and forth from parking area to library. I want my totes to be easy access. Other bags from other conferences have been used by my daughter or for shopping, but we have quite a large pile in the front closet now. Yes to the opt-in, opt-out option for bags and other give aways. Yes to putting money toward open access for C&RL (as long as it doesn’t become the EBSCO or Gale C&RL). I really like this ACRL conference bag; it’s lighter, keeps me from hauling too much stuff around, and isn’t black. 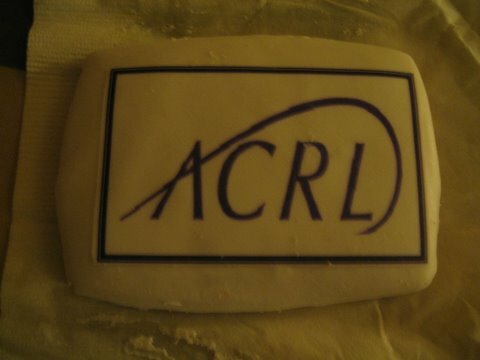 Did you try to eat that ACRL cookie? That I could have done without, but it was at least pretty. I still use the Baltimore bag — it makes a great organizer for family car trips. My one beef with the Seattle bag is the short straps. It just will not fit comfortably on the shoulder, which means that the bag will probably be stuffed in a drawer. It seems to be pretty sturdy, though. Thanks for your comments about the green conference bag, and its contents. The Green Committee was newly created at this conference, and is planned to become a permanent feature of future conference planning, so your input is most welcome. The bag and mug are sponsored items, and are not paid for from registration monies. The green bag was selected as a tote, not a briefcase; it bears no Seattle-specific marks, so can be reused by ACRL for other purposes. No bags were discarded by ACRL; some were brought back for re-use at other meetings, and the rest were donated to a local charity. The Green Committee’s purpose was to recommend and implement environmentally-friendly practices that would enhance the national conference and reduce its impact on the environment. We identified three main areas for our effort: 1) Inform and influence; 2) Reduce, reuse, recycle; 3) Commit to sustainability. We realized that our basic aim would be to try to influence the attitudes and behaviors of attendees–members and exhibitors–and conference personnel–hotels, convention center, caterers, and others. The Green Committee made a panel presentation at conference about its efforts. I invite you to check it out on the virtual conference site, once it’s available. A conference like ACRL National is a complex, multi-faceted event, with a lot of behind the scenes activity. The Green Committee’s initial challenge was to define the scope of its work, to focus its efforts to manage and reduce the environmental footprint of the event. Thank you for your thoughtful comments on this initial effort. I hope you’ll continue that level of engagement as the association and its members work to manage the impact of future conferences. I actually like and will use this ACRL bag now that I’m back from the conference. I always bring my own, non-library related bag to conferences (part of my incognito strategy), but I use a lot of conference bags for groceries. This year’s green bag is perfect for quick trips to the store–but then I shop for one. I usually hate this stuff, but I like the bag and the mug. I went to the green conference panel at ACRL and those folks worked incredibly hard to try out and provide the best products that would meet our need to acquire stuff and introduce us to some interesting/useful products. This was really pioneering work and they are planning to share their manual to help others implement green conference practices, which could have a huge future impact. I, for one, am impressed that this all actually happened. Now I can take those orange ALA bags to goodwil! For the most part, conference bags are terrible for anything – especially considering the straps are too short to hang over yoru shoulder. I would much rather they not give them out at all. NYLA probably wins hands down for having the most awful bags ever – they are god ugly BN bags that are thin, an odd, non-shape and can’t hold more then a sheet of paper without ripping. Olive green with wierd green shaded polka dots all over them. Just awful. Can’t even re-use them for anything because of their non-shape and short handles! I just throw in my suitcase a thin, foldable tote bag and use that at conference so I don’t have to worry about non-usable conference bags. So much easier. I prefer not to get bags at conferences, but this was my solution after I collected a file drawer full of them: when I moved offices, I took all the bags to the library’s staff lounge and put a sign by the pile indicating that they were free for the taking. They were picked off very quickly by delighted staff, I made friends, the bags went to good homes – it was a great solution. Similarly with pens and pencils, by the way. I’m picky about them, so after many vendor visits and giveaways, I hauled a bunch to the circ desk, where they were happily received. The Seattle green bag (so far) is good to carry my newspaper and books I am reviewing…So far, a couple of my students have inquired about giving it to them (I probably will). I collect the bags and give them out to my students. The orange bags from ALA-Anaheim, were an instant hit with my First Year Students for: dirty laundry, carrying books back/forth to the Hesburgh Library. I was able to get about 50 of those bags to give away during the orientation season on campus for incoming students. I also use them as grocery bags; they are durable and can handle a large load. I collect conference pens too because it brings home the names of databases to student’s mind when they are their own. I distribute in classes, at the Info Desk, or whenever I am doing outreach to faculty and student groups. I second Barbara’s comment..No more tchotskes! No more conference trinkets! I also think conference vendors should do away with their hundreds of plastic trinkets and handouts, but maybe I’m in the minority in this regard. WHy not give some of us the opportunity to take home the extra bags to give out at out libraries. This would mean they would stay in libraries, might reduce our costs for give aways, and be used. I drank vodka out of my acrl mug, and then I left it at the hotel. As for the timer, I cursed the packaging and then stuck it to my shower wall. The bag is great for groceries, but I agree that it could have had at least one little zipper pocket on the inside because i did use it in Seattle quite a bit and was having to drop little things on the inside of the bag. all in all, i really loved this post. i would be all about a “no bag, please” option on acrl registrations in the future.